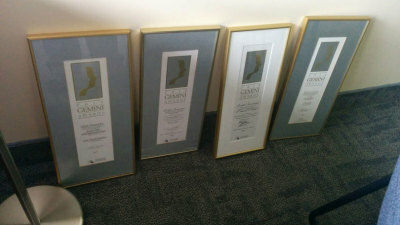 Four Gemini nominations propped against Benmergui’s office wall, a sign of him leaving his old life as a journalist and talk show host behind. Tucked in a corner office in Trafalgar’s B-Wing administration offices, one of the CBC’s more familiar faces is preparing to head out. He’s in a bit of a rush, as he has a conference call scheduled for his car ride, followed by a meeting in Brampton. If he’s late, he’ll be fighting traffic on the way back, something he’s eager to avoid. It’s another hectic day in, as he calls it, the “new life” of Ralph Benmergui. A former CBC journalist, host and producer for more than 20 years, Benmergui has been with Sheridan since July 2012. Having left his old life behind, as evidenced by the four Gemini nominations he has yet to bother to hang on his office walls, Benmergui now works directly under president Jeff Zabudsky as an “executive advisor.” It’s the sort of job he never thought he’d have. Benmergui, 59, is a part of Zabudsky’s executive team and is paid in the same range as a college vice-president, making him the seventh-highest compensated employee at Sheridan in 2013. But unlike his executive team peers, Benmergui is exempt from the traditional operations element of a typical vice-president’s job profile. He has no one working under him, allowing him to focus directly on the main reason he’s at Sheridan – government relations. After leaving the CBC in 2005, Benmergui spent five years as a host at Toronto radio station Jazz FM 91 and produced a series of documentaries for Vision TV. Wanting a change, he transitioned to his first job in politics as a senior adviser to Elizabeth May, the leader of the federal Green Party. A few months later, he left to work for the Ontario Liberals as a communications director for Glen Murray, then minister of research and innovation. Murray was later moved to the Ministry of Training, Colleges and Universities where he and Benmergui worked on developing the McGuinty government’s 30 per cent tuition rebate. I don’t have strategies for where I’m supposed to be in life. I just try to put myself in a position where wherever I am, I can be useful. It was the time spent at the ministry that Benmergui credits as the main reason for him being qualified for his role at Sheridan. Though, were it not for a chance encounter 25 years in the making, he might never have had the opportunity. In a meeting with college presidents and the ministry in early 2010, newly hired president Zabudsky recognized a former classmate from his years spent in Ryerson’s broadcast journalism program back in the mid 1980s: Benmergui. Though classmates, neither considered the other a buddy at the time, with Benmergui eventually dropping out to work for the CBC in 1985 and Zabudsky graduating in 1986. Zabudsky, already sensing the need for a government relations point man at Sheridan, approached Benmergui about working at Sheridan. He wanted to move away from consulting to building more lasting relationships with government officials, and Zabudsky saw Benmergui’s background in communications and his extensive list of contacts at provincial and municipal levels reason to believe he was an “ideal person” for the job. Zabudsky estimates Benmergui spends half of his time on campus and the rest of his time at Queen’s Park or with one of the two municipal or regional governments Sheridan has a campus based in. “As a journalist, I always thought I knew how government worked,” said Benmergui. “When you’re in government, you know how government works. 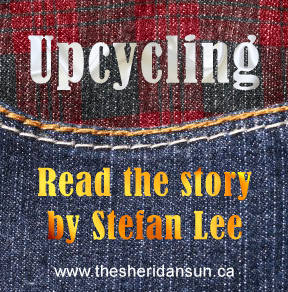 And it’s not what you think it is.” Though he’s been with Sheridan longer than his time spent in government, his experiences with the inner workings of government, and how to best navigate the webs of bureaucracy has proven to be a valuable asset. While the thought of someone walking around knocking on politicians’ doors all day may conjure the idea of Benmergui being a lobbyist for Sheridan, Zabudsky considers Benmergui’s efforts more akin to advocacy than lobbying. “There is no more money in the province,” joked Zabudsky. “It would be kind of useless for him to be lobbying for more money.” He views Benmergui’s role at Sheridan as a crucial function in a post-secondary environment. “Sometimes [governments] can give us things in policy that, frankly, are worth way more to us than money.” Zabudsky uses the example of more autonomy for program approval, as the process is often bogged down by government red tape. Zabudsky points to the recent addition of more than 200 Bachelor of Business Administration students at HMC as one of many projects Benmergui has been vital in enacting at Sheridan. Benmergui is involved in talks with Brampton city officials about a large downtown campus there, which Zabudsky is confident will be a success. Benmergui also played a role in arranging Ontario Premier Kathleen Wynne’s visit to Sheridan last year, he said. Although hired on a year-by-year contract, Benmergui keeps his options open when considering his future at Sheridan after it becomes a university. He enjoys the temporary nature of contract work, though his wife is not too enthused by it, and is open to staying on at Sheridan for as long as he’s needed. “I don’t have strategies for where I’m supposed to be in life. I just try to put myself in a position where wherever I am, I can be useful,” said Benmergui. “If I didn’t feel useful here, I wouldn’t be here. Added by Chris Coutts on September 17, 2014.